The book uses a unique interdisciplinary approach, which combines the behavioural sciences and international relations, in order to further the understanding of the 'terror' generated by strategic terror. 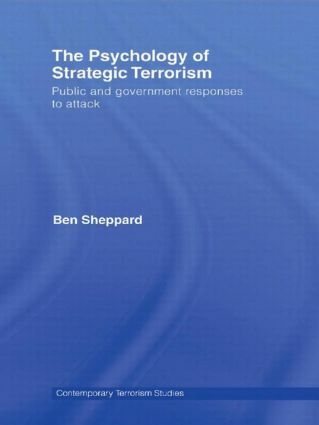 The work examines five contemporary case studies of the psychological and behavioural effects of strategic terror, from either terrorist attacks or aerial bombardment. It also looks at how risk-communication and public-health strategies can amplify or reduce psychological and behavioural responses, and considers whether behavioural effects translate into political effects, and what governments can do to relieve this. Ultimately, the study argues that the public is not prone to panic, but can change their behaviours to reduce their perceived risk of being exposed to a terrorist attack. This book will be of much interest to students of terrorism studies, homeland security, social psychology and politics in general.